Halloween Is More Funny Than Scary In St. Louis : The Two-Way What's orange and black and says "knock knock?" On Halloween, children in St. Louis are expected to tell jokes in order to earn their candy. 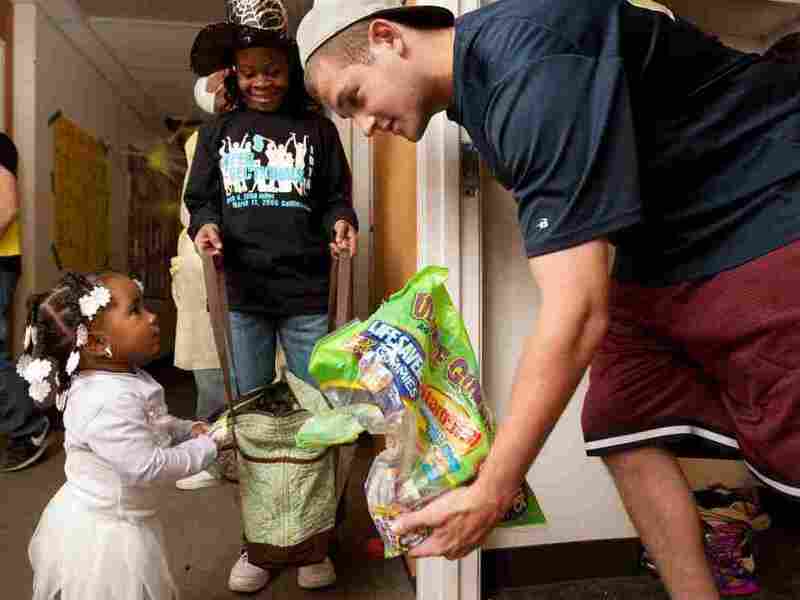 At Washington University in St. Louis on Sunday, student Andrew Dwoskin was handing out candy to local children during a "Safe Trick-or-Treat" event. Being a comedian, Joe Marlotti is always afraid he won't get laughs. But he grows especially nervous this time of year. After all, a comedian doesn't want his kids to bomb when it comes time to tell jokes. Marlotti hails from St. Louis, where local Halloween tradition calls for children not to say "trick or treat," but to tell a joke in order to earn candy. "I've been all around the block — literally — telling them that it's important to tell the joke right, or it makes me look bad," Marlotti says. "What does a skeleton always say before eating?" The jokes don't have to be about scary subjects — and, despite the pressure Marlotti puts on his children, they don't have to be funny or even told right. Kids are graded totally on effort. Joke-telling on Halloween is not unique to St. Louis. Apparently, the tradition actually started in Des Moines, where it began as a Depression-era attempt to curb hooliganism, which included upending trash cans, turning on fire hydrants and shooting out streetlights. The theory seemed to be that kids would perform fewer pranks if they had to come up with a harmless sort of trick to receive treats. -- Why couldn't the skeleton cross the road? -- What's a vampire's favorite drink? -- What do you get when you mix Frosty the Snowman with a vampire? -- What do witches put on their hair? -- What did the vampire take when he got a cold? "You ask a question or you tell a joke — in other words, you tricked that person," says John L. Oldani, the author of Passing It On: Folklore of St. Louis. When this blogger moved to St. Louis with my family last year, Halloween joke-telling was one of the things about the city that immediately seemed odd. One friend of ours says he'll give pencils to kids who fail to tell jokes, while any who even try to be funny can count on getting a candy bar. I know of one 8-year-old boy who, for the moment, is saying he's not going to go out tonight because of the pressure of having to perform repetitively for the benefit of strangers. But for the locals, corny jokes are so much a part of Halloween culture that they're surprised to learn they're not the custom everywhere else. "When I was a kid, it was required," says Garrison, the alt-weekly editor. "I don't think anyone slammed the door in your face, but you had to tell a joke." It came as a shock when he moved for a time to Austin, Texas, and kids there didn't come to his door ready with a quip. "I'd ask them, 'What's your joke?' " he says, "and they looked at me like I was crazy." Last year, the St. Louis Post-Dispatch posted a video of 90 Halloween Jokes in 10 Minutes.